Last week I brought the news to you of a rumored high-end chromebook, along with a video, and within that span we’ve seen the actual low-key release of it, the Chromebook Pixel, which Google seems to be using as a weird experiment into “what if”. For those of you that are unaware of Chromebooks, they’re laptops based on Google’s Chrome OS, all of which have fell into the low end until now. 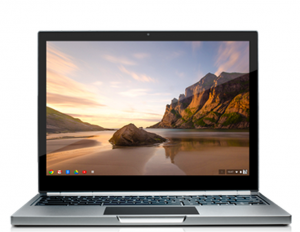 Current chromebooks retail for around $300 and offer a simple web-based internet experience, hailed as an affordable, safe, no-hassles portal to technology. The Chromebook Pixel, released on Thursday, is Google’s weird attempt at bringing that concept of simplicity into the high-end. Essentially, they’ve focussed on the hardware, completely decking out the Pixel with an extremely high resolution multitouch display, an intel i5 processor, and 32 Gb of flash storage built-in, plus 1 TB of cloud storage. Like a tablet, there’s a wifi model, and a more expensive 4G LTE model. It’s a beautifully crafted device, and I almost considered buying one until I saw the price, starting at $1300. Despite the beautiful design, the hardware is not outstanding enough to demand $1300+. It has a dual core processor, and only 4 GB of RAM, plus only 32 GB of storage. It’s even weaker in the software category, which relies completely on the Chrome web store, an app store of sorts which offers browser-based apps, and games. Since the Chrome store has never really skyrocketed in growth (despite Chrome taking the world’s #1 browser slot), there are very few developers, and the selection of apps is weak, limiting the use of that fancy high-resolution touch display. So what was google thinking? The Pixel, as many have pointed out, was never meant to fly off the shelves. It’s an experiment meant to hook in a few power-users, and attract developers, while also setting a new standard of chromebook. Google has traditionally outsourced manufacturing of Chromebooks to companies like Samsung, so the Pixel is meant to represent google’s vision, and influence future models. The slogan of the device is even “For What’s next”. I like the Chromebook approach. Google is trying to take the tablet approach of flexibility, portability, and ease-of-use/simplicity, and apply that to laptops and computers, offering a new way to experience the web, with automatic no-hassle updates, and universal compatibility. I do think there’s work to be done improving the functionality of the OS itself so that it’s appealing enough to switch. The chromebook isn’t a perfect product by a longshot, but it’s a good experiment to help Google move in the right direction, and that should benefit us all.